The Prairieville Community Prairieville Township is located in the southwest corner of Barry County, less than an hour's driving time from two of Michigan's preeminent urban areas: Kalamazoo to the south and Grand Rapids to the north. As such, it has become a popular location for people who desire a country lifestyle while maintaining proximity to jobs and the other amenities available in urban areas. The township shares boundaries with Allegan County to the west and Kalamazoo County to the south. 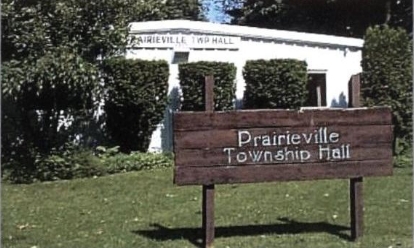 Prairieville Township is a rural community, with only one small town settlement. Denser development is located on some of the lakes and a few scattered subdivisions. As a result, the township retains a feeling of "wide open spaces." Prairieville Township is characterized by rolling hills, woodlands, farms and lakes. Pine Lake and Upper Crooked Lake are developed with residential homes around most of their shorelines, while Lower Crooked Lake is located in the Lux Arbor Reserve (part of the W. K. Kellogg Field Station, a research facility of Michigan State University) and undeveloped. Several small lakes are scattered throughout the township, each with varying degrees of development. The northern tip of Gull Lake is located in the southeast corner of the township. Gull Lake is surrounded by large homes and a popular park and boat ramp.